I don’t always talk about whales on this blog, but when I do, I prefer to talk about their size or echolocation. This time it’s about size. We all know many whales are really, really big. What we hadn’t quite understood yet is when they got big, or why. 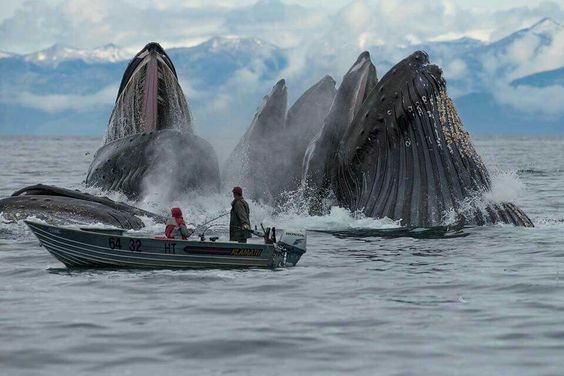 A photo of several baleen whales surfacing as they engulf tiny krill. Source unknown. Thankfully, a new [article] ran an analysis to figure out these two missing pieces. The authors used a dataset of 13 living and 63 extinct whales, including DNA (for the living ones) to create an evolutionary tree with time estimates for each branching point (called branch lengths). Using this tree and a dataset of body sizes, the authors used a model-testing approach to assess how the timing of whale evolution took place. What’s a model testing approach? A model-testing approach is when we use computers to test the fit of different models to the data we give it. In this case, the authors gave the computer the tree and the body size data. The authors picked several different models for the computer to test. One of the models was based on random events driving evolution. One of them was based on evolution with a trend towards one trait. Some of the models were combinations of the others, where the model changes at a certain point during evolution. Once the computer is done testing each model, it produces a few statistical values that tell us how well each model fit the data. A representation of the authors hard at work. For this study, the authors wanted to know which model of evolution best fit the evolution of giant sizes in whales. The computer’s analysis showed that body size evolved randomly until around 3 million years ago when there was a shift to evolution with a trend of becoming very large. Even though filter feeding using baleen had been present in whales since 25 million years ago, it wasn’t until recently that they became very large. Around 3 million years ago, during the Plio-Pleistocene, wind-driven upwelling (where wind patterns on the surface bring up nutrients from the ocean floor) started getting stronger. This concentration of small food items is probably what lead to whales getting gigantic. How upwelling works. Higher winds on the surface push the warmer surface water away from the coast. Colder, nutrient-filled water from the bottom gets pulled up. From NOAA. This entry was posted in English and tagged Body Size, Model Testing, Upwelling, Whales. Bookmark the permalink.